In 1964 Chelsea School of Art moved to a new building in Manresa Road, near the famous Kings Road SW3. The school was a landmark project for the London County Council and the Principal of the new school, Lawrence Gowing, was given a unique opportunity to build a world class library and teaching collection to go alongside the purpose built studios and workshops. 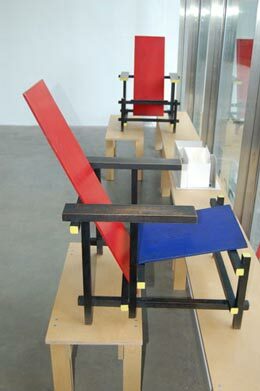 Artefacts purchased by Gowing include a major bronze sculpture by Henry Moore, Marcel Duchamp’s Rotoreliefs, and a pair of Gerrit Rietveld’s iconic Red and Blue Chairs shown here. Gerrit Rietveld was a member of the ‘de Stijl’ movement along with Piet Mondrian, the Red and Blue Chair was designed in 1917 and was one of de Stijl’s earliest experiments in 3 dimensions. 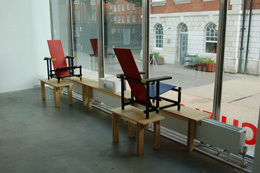 Chelsea School of Art ordered these particular chairs directly from Rietveld in 1963 and they were fabricated by G.A. van de Groenekan who had worked with Rietveld since 1918. In 2005 Chelsea College of Art and Design left the Manresa Road site and moved to Millbank and CHELSEA space opened that same year. The model of CHELSEA space shown here is by Ami Kanki and depicts our recent exhibition–Roger Ackling: Down to Earth. Roger Ackling is an inspirational artist and teacher who taught at Chelsea for 31 years. He makes his work by projecting sunlight through a lens to burn lines of tiny dots onto found and discarded materials. For the exhibition at CHELSEA space Ackling showed a group of works made on discarded wooden boxes and the handles of tools. Ami Kanki is interested in how we use space, she makes models of buildings such as galleries and then films them. The films appear to be CCTV footage of real spaces though, of course, there is no human presence. It is somehow appropriate that her work refers to surveillance because Chelsea College of Art and Design is on the former site of the Millbank Penitentiary, a 19th Century prison that pioneered sophisticated observation techniques.